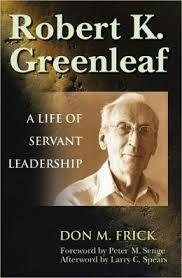 Robert Greenleaf had a profound effect on helping people to see the leader’s role as that of servant. Such leaders may have a strong will. They focus on serving the work and the people, however, rather than their own self-interest. So they may go the following route. A better society, one that is more just and more loving, one that provides greater creative opportunity for its people. Since Robert’s death The Center has become a thought-leader in the field of servant leadership and a steward of his writings. The Center hosts annual international conferences. It also aims to connect, educate and inspire servant-leaders around the world. Here is what the Greenleaf Center says about servant leadership. You can find the following description on their web site. 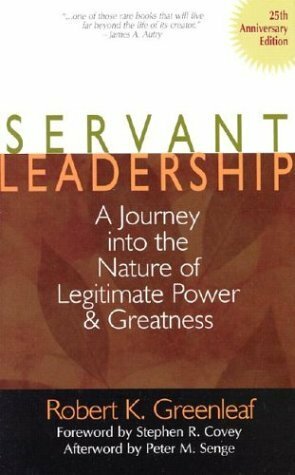 While servant leadership is a timeless concept, the phrase “servant leadership” was coined by Robert K. Greenleaf in The Servant as Leader, an essay that he first published in 1970. “The servant-leader is servant first … It begins with the natural feeling that one wants to serve, to serve first. Then conscious choice brings one to aspire to lead. “The leader-first and the servant-first are two extreme types. Between them there are shadings and blends that are part of the infinite variety of human nature. “The difference manifests itself in the care taken by the servant-first to make sure that other people’s highest priority needs are being served. “Do those served grow as persons? Do they, while being served, become healthier, wiser, freer, more autonomous, more likely themselves to become servants? “And, what is the effect on the least privileged in society? Will they benefit or at least not be further deprived? 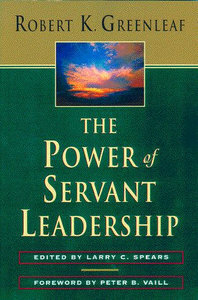 Robert Greenleaf recognized that organizations as well as individuals could be servant-leaders. Indeed, he had great faith that servant-leader organizations could change the world. Robert was born in 1904, in Terre Haute, Indiana. He went on to study mathematics and then joined AT&T. Bob’s mission was to have a career of quiet influence of ideas from inside one of those big businesses. Robert rose through AT&T and went on to develop the concept of servant leadership. Here are some extracts from his biography, which you can find at the Greenleaf Center’s site. In 1929, Greenleaf was transferred to AT&T headquarters in Manhattan. He soon met and married Esther Hargrave, a gifted architect and artist who opened her husband to modern art, intuition, books he might never have read, and overall personal evolution. Greenleaf quickly rose in the AT&T organization, participating in its first management training program and traveling for five years as a trouble shooter for the more than 200 “Ma Bells” and other companies associated with the communications giant. Setting up a program to expose up-and-coming leaders to the humanities, even bringing in famous theologians and psychologists to speak about the wider implications of corporate decisions. Greenleaf retired in 1964 and began his second – and most productive – career as a writer, consultant, and teacher. Greenleaf’s seminal essay The Servant as Leader was published in 1970. In it, he proposed that the best leaders were servants first, and the key tools for a servant-leader included listening, persuasion, access to intuition and foresight, use of language, and pragmatic measurements of outcomes. Such leaders demonstrate certain characteristics. Here are some of those described by Larry Spears, former CEO of the Greenleaf Center. You can discover more about these themes at the superb web site hosted by The Leadership Hub. Listening, coupled with periods of reflection, is essential to the growth and well-being of the servant-leader. The servant-leader strives to understand and empathize with others. The healing of relationships is a powerful force for transformation and integration. Awareness helps one in understanding issues involving ethics, power and values. It lends itself to being able to view most situations from a more integrated, holistic position. Another characteristic of servant-leaders is a reliance on persuasion, rather than on one’s positional authority, in making decisions within an organization. Servant-leaders seek to nurture their abilities to dream great dreams … (they) are called to seek a delicate balance between conceptual thinking and a day-to-day operational approach. Foresight is a characteristic that enables the servant-leader to understand the lessons from the past, the realities of the present, and the likely consequence of a decision for the future. It is also deeply rooted within the intuitive mind. Servant-leadership, like stewardship, assumes first and foremost a commitment to serving the needs of others. The servant-leader recognizes the tremendous responsibility to do everything in his or her power to nurture the personal and professional growth of employees and colleagues. The servant-leader senses that much has been lost in recent human history as a result of the shift from local communities to large institutions as the primary shaper of human lives. This awareness causes the servant-leader to seek to identify some means for building community among those who work within a given institution. Robert ideas had a profound influence on many people. On The Center’s web site you can find the following appreciation from Peter Senge. I believe that the book Servant Leadership, and in particular the essay, “The Servant as Leader,” which starts the book off, is the most singular and useful statement on leadership that I have read in the last 20 years. Despite the virtual tidal wave of books on leadership during the last few years, there is something different about Bob Greenleaf’s essay, something both simpler and more profound. This one essay penetrates to such a depth that it resonates in us, like the after tones of a Buddhist meditation gong, calling us to quiet. Rereading the essay, I found myself stopped, repeatedly, by a single sentence or phrase. For many years, I simply told people not to waste their time reading all the other managerial leadership books. Here is a video of Robert talking in 1986. In it he explains how institutions can focus on serving people.